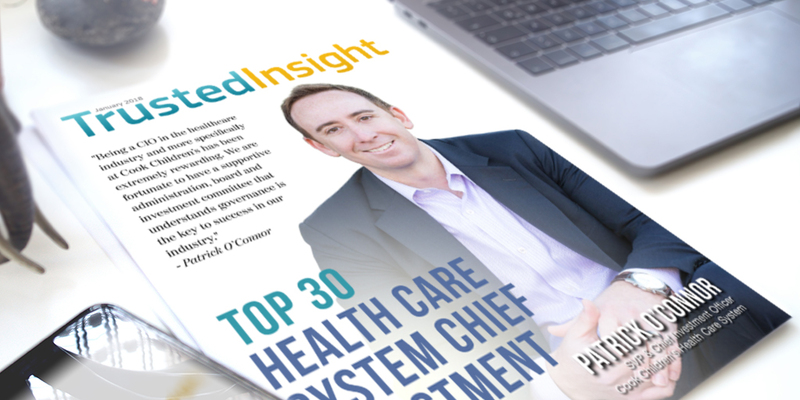 John Barker is the chief investment officer of Partners Healthcare, where he manages the hospital's investment portfolio. Previously, Barker was a managing director at Harvard Management Company and an alternative asset manager at Wellesley College. Barker holds an MBA from the University of Pennsylvania, The Wharton School and a bachelor's degree from Dartmouth College. Jacque Millard has been the vice president and chief investment officer at Intermountain Healthcare since 1993. Previously, she was an investment comittee member at Dignity Health. Prior to that, she was was part of the endowment comittee at Westminister College for 19 years. Millard holds an MBA in marketing managment from Westminster College and a bachelor's degree in finance from Weber State University. She also holds a Chartered Financial Analyst designation. David Erickson is the chief investment officer at Ascension Investment Management, where he is responsible for the administration, management and coordination of investments and operations. Prior to this, he was chief investment officer at the University of Wisconsin Foundation. He also previously was a vice president and investment strategist at Strong Capital Management in Wisconsin and was a derivative specialist with PNC Bank/PNC Capital Markets in Pennsylvania, Chemical Bank in New York, and Firstar Bank in Wisconsin. David holds a bachelor's degree in economics from Wheaton College and holds a Chartered Financial Analyst designation. Nicholas Procyk is the senior vice president and chief investment officer of Children's Hospital of Philadelphia. Procyk’s responsibilities include investment policy, asset allocation, and investment manager selection for the Children's Hospital Foundation and pension fund. Prior, he served as the vice president of the Church Pension Fund for seven years. Procyk holds a B.S. from the University of Pennsylvania and an MBA from Columbia University. Robert Durden has been chief investment officer at Texas Children's Hospital since March 2013. Previously, he was managing director of private investments at Morgan Creek Capital Management. Prior to that, he served in corporate strategy at Western Asset Management LLC. Durden holds an MBA in finance from the University of Chicago Booth School of Business and a bachelor's degree in economics from Princeton University. Catherine Abely has been the investment director at the Children's Healthcare of Atlanta since 1996. She currently oversees $3.8 billion in assets under management. Abely holds a bachelor's in accounting from Providence College. She also holds Chartered Financial Analyst, Chartered Alternative Investment Analyst and Certified Public Accountant designations. Landis Zimmerman has been chief investment officer and vice president at Howard Hughes Medical Institute since 2004. Prior to Howard Hughes Medical Institute, he held the title of chief investment officer at University of Pennsylvania Endowment. Before that, he worked at Rockefeller Foundation, where he worked on asset allocation as well as managed the private equity and fixed income. Zimmerman holds a B.S. in economics from University of Pennsylvania and an MBA from University of Pennsylvania's Wharton School. Bradley Bond has been the chief investment officer and vice president of treasury at University Hospitals since 2002, where he is responsible for managing $2.7 billion of investments. Prior to that, he was acting treasurer at Cleveland Clinic for nearly 8 years. Bond holds an MBA in finance from the Weatherhead School of Management at Case Western Reserve University and a B.S. in accounting and finance from The Ohio State University. He also holds a Chartered Financial Analyst designation. Josh Rabuck is executive director and chief investment officer at Indiana University Health. He previously held the role of director of absolute return and deputy chief investment officer at the state of Indiana's pension plan. Rabuck holds a B.A. in business and religious studies from Franklin College. Greg Schuler is chief investment officer and treasurer at BJC Healthcare, one of the largest nonprofit health care organizations in the U.S. Schuler holds an MBA and bachelor's from the University of British Columbia, Sauder School of Business. He also holds a Chartered Financial Analyst designation. Sue Slocum is the treasurer and investment officer at Children's Hospitals and Clinics of Minnesota, where she is responsible for all banking, debt, pension and investment management for the pediatric health system's $1.2 billion in net assets. Prior to this, she was a portfolio manager and money market economist at Nakagama and Wallace Investment Management, where she managed $300 million in offshore, fixed income portfolios. Slocum holds an MBA in security and portfolio analysis from the University of Minnesota, Carlson School of Management and a B.A. in psychology with a minor in Latin from Carleton College. Paul A. Gorman is the co-chief investment officer & assistant treasurer at Mayo Clinic. Prior to his current role, he served as an investment manager, investment officer, senior investment officer and deputy chief investment officer for Mayo Clinic. Gorman holds an MBA from Northwestern University's Kellogg Graduate School of Management and a bachelor's degree from Dartmouth College. David Holmgren is chief investment officer at Hartford HealthCare, where he manages $3 billion not-for-profit investment portfolio. Previously, he served as the principal investment officer for the Connecticut State Treasury and an investment consultant at UBS Asset Management. He has 26 years of investment experience in the U.S., Europe the and Middle East covering traditional and alternative assets. Holmgren holds an MBA from Columbia University and a B.A. in economics and spanish from Denison University. Dina Richard is the senior vice president of treasury and chief investment officer of Trinity Health, a national Catholic health care system headquartered in Livonia, Michigan. Previously, she served as the vice president of investments for Taubman Ventures Management, a Michigan-based single-family office. She also serves as chairman for the investment committee of the Detroit Institute of Art. Richard holds an MBA in finance and international business from Wayne State University in Detroit and a B.A. in business administration from the University of Michigan. She is also a Certified Public Accountant. Patrick Thomas has been the chief investment officer at Sutter Health since 2015. Prior to Sutter Health, he was a managing director at Strategic Investment Solutions for 17 years. Thomas holds an MBA from Georgetown University and a bachelor's degree from the University of California, Berkeley. Rob Roy is chief investment officer for Adventist Health System, where he oversees the organization's investment assets of roughly $10 billion. Previously, he was chief investment officer at Cain Brothers Asset Management. Roy holds an M.S. in financial markets and trading from the Illinois Instittute of Technology and a B.A. in applied mathematics from Southern New Hampshire University. William Lee joined New York Presbyterian Hospital as chief investment officer in June 2016, where he oversees the hospital's $7 billion investement assets. Previously, he was the chief investment officer of Kaiser Permanente, a health care system with $75 billion of assets under management. Prior to that, Lee served as chief investment officer of Levi Strauss & Co. and as senior vice president and chief investment officer of Bank of America. Lee holds an MBA in finance from California State University-Hayward. Stefan Strein is the chief investment officer at Cleveland Clinic, where he is responsible for the strategic direction and investment management of the Clinic’s investable financial assets. Previously, he was the vice president and chief investment officer at the Annie E. Casey Foundation. Prior to that, he was a member of the general partner in two early stage venture capital firms and worked in commercialization and licensing of university-developed technology. Strein holds a bachelor's degree from Washington College and a master's degree from Johns Hopkins University. Patricia Steeves O'Neil is the current chief investment officer and treasurer at Rush University Medical Center. She's been with the insitution since 1999, holding various others roles including assitant vice president and vice president and treasurer. Prior to that, she was a managing director at bank of America. O'Neil holds a master's in applied economics from the University of Michigan and a B.A. in mathematics and economics from Mount Holyoke College. Rick Graniere has been the chief investment officer and corporate treasurer of MemorialCare Health System since January 2014, and has been an executive with MemorialCare Health System for 30 years. Previously he served as chief financial officer at the hospital system, and as chief financial officer and senior vice president of Long Beach Memorial Medical Center and Saddleback Memorial Medical Center. Graniere holds a bachelor’s degree in accounting from California State University, North Ridge. He also holds a Certified Public Accountant designation. Leslie Lenzo is the chief investment officer of Advocate Health Care, overseeing a total asset portfolio of more than $6.5 billion. Previously, Lenzo worked as an investment manager at Northwestern Memorial HealthCare and equity research associate at SG Cowen. Lenzo holds an MBA from Boston University School of Management and a bachelor's from Georgetown University. William Walker is vice president and chief investment officer at the Baylor College of Medicine Endowment, which has more than $1 billion in assets under management. Chris Halaska is senior vice president and chief investment officer at Memorial Hermann Health System since 2012. During his tenure the investment portfolio has been transformed from largely cash and fixed income to a diversified endowment style portfolio with a long-term investment horizon. Previously, he worked in investment banking at J.P. Morgan for more than 12 years. Halaska holds an MBA and BBA in finance from the University of Texas at Austin. 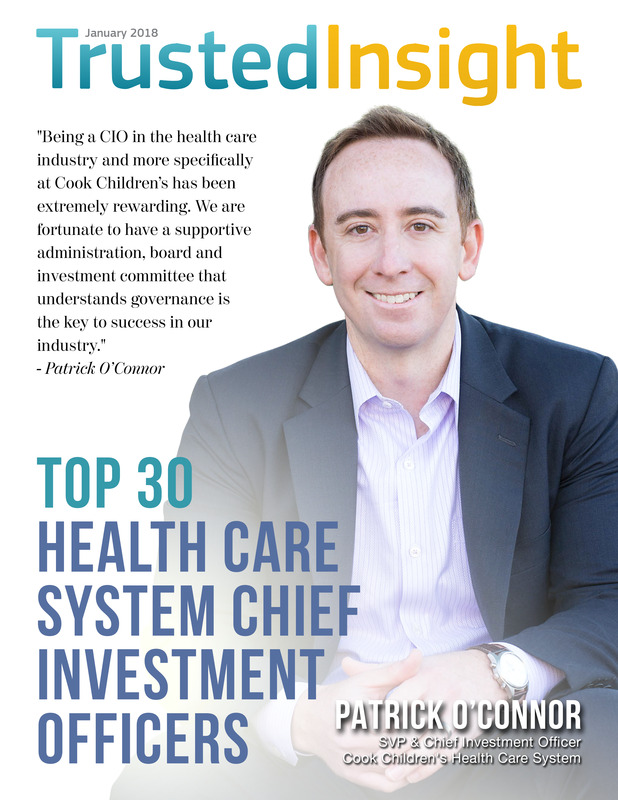 Patrick O'Connor is senior vice president and chief investment officer at Cook Children's HealthCare System, where he oversees more than $2 billion in total assets. Previously, he was chief investment officer at the University of Arizona, where he managed the endowment and operating capital. He also serves on the board of Communities Foundation of Texas, Capital for Kids and the YMCA of Metropolitan Fort Worth Endowment. O'Connor holds an MBA from Northwestern University, Kellogg School of Management. Scott Pittman has been senior vice president and chief investment officer at Mount Sinai Health System since 2008, where he oversees the institution’s $1.9 billion endowment and long-term capital. He also serves as the chairman of the FOJP Investment Committee and serves on the Investment Committee for Healthfirst. Prior to joining Mount Sinai, he served as the director of investments at Baylor University. He taught Baylor’s Portfolio Practicum course in the Hankamer School of Business, where students actively managed a $6.5 million investment portfolio. Alyssa Rieder is the vice president and chief investment officer of Diginity Health, where she oversees the management of the hospital's $9 billion investment program. Previously, she was an investment officer at the University of California and a lead portfolio manager at Franklin Templeton. She is also a committee member of SDG&E Nuclear Decommissioning Trust Fund and a board member of Castilleja School. Rieder holds an MBA from the Stanford Graduate School of Business and a B.A. in quantitative economics from Stanford University. Jason Klein joined Memorial Sloan Kettering as its first vice president and chief investment officer. Klein oversees the center’s complex investment portfolio, which is globally diverse and includes several niche alternative investments. Previously, he was chief investment officer for the Museum of Modern Art and had been a vice president and principal in the private equity division of Lehman Brothers. Klein holds an MBA from the Wharton School and a JD degree from the University of Pennsylvania Law School. Anthony Waskiewicz is the chief investment officer at Mercy Health, where he oversees the health system's more than $2.7 billion investment program. He has over 25 years of investment experience advising and managing assets for institutional investors. Prior to taking on his first role as CIO in 2004, Waskiewicz spent 15 years in the asset management and advisory business, working with industry leaders at T. Rowe Price, Mercer Investment Consulting, Evergreen Investments and Morgan Stanley. Waskiewicz is an active member of the investment community serving as a member of the CFA Institute and the St. Louis Society of Investment Analysts. He also serves as an adjunct professor in the business school at Webster University, St. Louis. Waskiewicz holds a degree in business administration and management from Washington & Lee University in Lexington, Virginia. He holds a Chartered Financial Analyst designation. Ryan Bailey is the head of investments at Children's Health System of Texas, where he oversees $1.5 billion in assets. Prior to Children’s Health, he served as investment officer and interim chief investment officer of the Meadows Foundation. Bailey hold's a bachelor's degree in economics from Yale University. He also holds a number of certifications including: Chartered Financial Analyst (CFA), Financial Risk Manager (FRM), Chartered Alternative Investment Analyst designation (CAIA), and Chartered Market Technician (CMT) designations. Anurag Pandit is chief investment officer of ALSAC, the fundraising and awareness organization for St. Jude Children’s Research Hospital. Previously, he served as the director of investments at Boston Children's Hospital, where he focused on emerging markets and distressed debt. Prior to that, he was a founder and managing partner at Lexicon Management. Pandit holds a master's in management and finance from MIT, Sloan School of Management and a bachelor's from the University of Delhi.